This post continues the theme of localized analysis begun in the post Towards a Localized Analysis. The analysis presented in our articles and blog post such as The Signature of Gerrymandering , Firewalls, and Hearing the Will of the People are largely based on a global, statewide analyses. In many ways, Gerrymandering is a global phenomenon as one can not change one district with out effecting its neighbors which often causes a cascade of changes across a state. Packing a particular group in one district is done to dilute the groups effect in other districts. The most basic measure of a districting plan’s character is the partisan make up of its elected representatives. When comparing a plan’s partisan make up with a set of comparison maps, we obtain a view that is fundamentally global in measuring gerrymandering. Marginal box-plots can be used to identify particular districts as unusual. This is a step towards a more localized analysis. 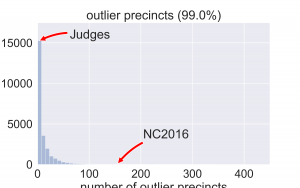 As described in The Signature of Gerrymandering post the marginal box-plots of the ranked vote curve were used to identify specific districts, in the legislatures 2016 maps, which were arguably cracked and packed in court case Common Cause v. Rucho concerning the 2016 NC Congressional maps. In the Marginal box-plots, a particular set of votes is used to order the districts from most to least Republican in the ensemble of districting plans; to examine a particular district in a given plan, we first consider the district’s rank in the order (from most to least Republican) and then compare that district’s partisan make up with the partisan make up of the districts in other plans with the same rank in the order. Such analysis examines deviations in the the overall statewide structure of votes along with with where this deviation may occur, but it does not geographically constrain the districts with which to compare the district of interest. Localized analysis begins by choosing a particular precinct of interest and collecting the districts containing this precinct from an ensemble of state wide maps. The resulting collection of districts, all which contain the precinct of interest, can then be used to characterize the typical district-level political environment that voters in this precinct could expect to experience. By contextualizing a precinct within the collection of districts containing it, we may relate the partisan preferences of the precinct’s voters to the preferences of their typical district. For example, a precinct’s voters may prefer one party, but typically find themselves in a district that votes for the opposing party; in this sense we may determine whether or not it is natural for the typical voter within a given precinct to be able to elect a candidate associated with the party they have voted for. We contextualize the typical district containing a precinct by constructing a histogram over the ensemble of districts (this process was described in detail the previous post Towards a Local Analysis.) This distribution can then be used to deicide if the district containing the precinct in a given plan is atypical. If a precinct does find itself in an atypical district, then its residents may have cause to object. In this way, the ensemble of districts can be used in a normative way to identify outliers. Similarly to our previous blog post (Towards a Local Analysis) we again apply the above analysis the North Carolina Congressional Map from the 2016 and 2012 elections which we will abbreviate respectively NC2106 and NC2012. We will also consider the map produce by the retired judges from Beyond Gerrymandering Project lead by Tom Ross. This map will be denoted “Judges”. Previously we used a 5% outlier condition which many may classify as rare, but is more arguably extreme. We adapt the current analysis to examine more extreme outliers (those that occur less than 1% of the time, rather than 5%). In the table below, we show the number of precincts which are extreme outliers from 2,692 predicts in different NC Congressional maps for the using the 2012 and 2016 US Congressional elections, denoted by USH12 and USH16 respectively. For comparison purposes, we then tabulate the number of maps in our ensemble which have that many or more precincts which are extreme outliers. The histograms below give the full histograms of the number of maps with different numbers of outlier precincts using the two sets of election data mentioned above. The second three use the USH16 election data. Instead of just using the using the precinct localized distribution constructed above to flag districts individual as outliers, one can calculate the likelihood of partizan vote fraction being as far or farther in the tail then that each precinct in a given map. Averaging this across the state gives a measure of how typical the precinct by precinct are across the whole map. To contextualize this average spatial log likelihood calculate the value for each map in our ensemble. The following two histograms summarize the results. 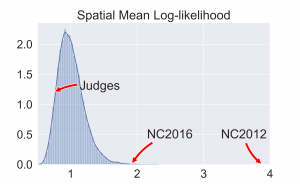 Again to show the spatial structure better, we plot the log likelihood across the state, precinct by precinct. So that the direction of the swing is visible, we label democratic with positive values and republican with negative. The above maps use USH12 election results while the maps below use UH16 election results. In Gill v. Whitford, twelve voter-plaintiffs challenged the Wisconsin legislature’s 2011 redistricting as a violation of Fourteenth Amendment equal protection rights and a burden on First Amendment associational rights. After a bench trial, the district court concluded that the 2011 map had the intent and unjustified effect of “plac[ing] a severe impediment on the effectiveness of the votes of individual citizens on the basis of their political affiliation,” and entered judgment in favor of plaintiffs on both constitutional claims. The trial court based its findings of discriminatory effects on a compelling and extensive record that would have withstood appellate review under the deferential standard applicable to such causal and statistical inferences. In a recent unanimous decision, however, the Supreme Court did not reach the merits of the claims, and instead vacated the district court’s judgment on the grounds that the plaintiffs had failed to demonstrate standing to bring their case. Describing the necessary standing as limited to “voters who allege facts showing disadvantage to themselves as individuals,” the Court determined that only four of the twelve voter-plaintiffs had complained of injuries specifically stemming from the packing or cracking of their own districts, and that the case at trial had improperly focused on statewide harm. The four plaintiffs pleading individual harms will have another opportunity to advance their claims on remand. Without directly addressing the justiciability or merits of the claims, the Court noted that the plaintiffs had based their showing of statewide harms on measurements of partisan asymmetry, in accordance with the “social science tenet that maps should treat parties symmetrically.” The basic idea that courts can evaluate the severity of partisan gerrymandering in terms of “the extent to which a majority party would fare better than the minority party, should their respective shares of the vote reverse,” had been previously considered in LULAC v. Perry but found by Justice Kennedy to “shed no light on ‘how much partisan dominance is too much.’ ” The Gill plaintiffs had responded to this concern by offering the efficiency gap as a quantitative measure of partisan asymmetry, defined by political scientist Eric McGhee and legal scholar Nicholas Stephanopoulos as “the difference between the parties’ respective wasted votes in an election, divided by the total number of votes cast.” As the Court pointed out, however, a single statewide number could not describe the effects of the 2011 redistricting on individual voters in different parts of the state. Up until now, this blog has investigated whether gerrymandering has occurred. In this post we begin to investigate where gerrymandering has occurred. The question of ‘where’ is interesting for both scientific and legal reasons. Scientifically, one may want to determine which precincts were atypically manipulated to achieve a political goal. Legally, an argument for individual harm is needed to pursue suits based on 14th amendment claims: Whitford vs Gill was decided on standing and dismissed because the plaintiffs did not establish that they had been individually harmed by the redistricting process. A histogram of vote fractions over a collection of districts all containing a given precinct. The dictionary definition of gerrymandering, “to manipulate or change the boundaries of (an electoral constituency) so as to favor one party or class,” presupposes some conception of the expected outcome and structure of an election. Implicitly a complainant challenges a map as gerrymandered because it fails to align with this expectation in some critical way. Measures like the efficiency gap or partisan symmetry offer conceptual, idealized alternatives against which a given map’s compliance is measured. The efficiency gap values a rather arbitrary relationship between the number of seats and the overall vote fractions. (See Bernstein and Duchin or Tapp). Partisan symmetry posits the superficially appealing idea that both parties should be treated symmetrically when each have the same global vote fraction, ignoring if symmetry is truly reflected in a geopolitical landscape. Neither takes into account the heterogeneity of population densities, the shapes of states or differences in where various political constituencies live. Requirements imposed by the Voting Rights Act or statutes requiring that counties or municipalities be left whole where possible, are not directly incorporated into the partisan symmetry measure. There is another path, which builds on well- established methods of modern computational statistics: constructing a representative ensemble which can be used normatively to establish a baseline against which deviations can be measured. It does not dictate political outcomes based on some idea of fairness where it is difficult to incorporate demographic ground truths, the effects of geography, or the preservation of municipal entities and communities of interest. Rather one encodes the design principles of a desirable map in an ensemble of maps and then lets the typical electoral behavior reveal itself. The design criteria are typically nonpartisan criteria such as spatial compactness, contiguity, equal population division and the minimization of fragmented counties and municipalities. It can also include items such as compliance with the Voting Rights Act (VRA). With the possible exception of VRA compliance, these criteria do not overtly create any new partisan bias, leaving (rightly) only those inherent in our political system and the distribution of voters about a particular geographically distinct state. It is important to separate (i) the use of such an ensemble, (ii) its generation and (iii) the choice of the design criteria. Each is intellectually independent and, as such, can be critiqued separately. Here we mainly wish to concentrate on the use of an ensemble. Though we will comment briefly on the other elements, we will largely leave the discussion of the other elements to future works or posts. A new Motion to Affirm was filed recently discussing, among other things, the Quantifying Gerrymandering group’s work in the case. 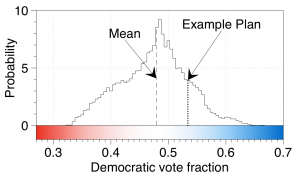 It particularly highlighted the box plot showing the “Signature of Gerrymandering” and how the analysis indicated that some districts were packed while other cracked. The motion can be found on SCOUS’s webpage. Our Quantifying Gerrymandering group at Duke generated an ensemble of over 24,000 redistricting plans, sampled from a probability distribution placed on the collection of redistricting plans. The ensemble was used to evaluate the 2012 and 2016 congressional district plans enacted by the NC General Assembly. The two enacted plans were both found to be statistical outliers in the context of the ensemble of 24,000 plans; this outlier analysis formed the central argument of Jonathan Mattingly’s testimony in Common Cause v. Rucho. In the outlier analysis, the most obvious statistic to consider is the partisan makeup of the congressional delegation each map produces. 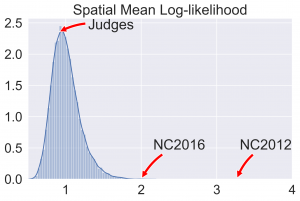 The following histograms show that the 2012 maps (NC2012) and 2016 maps (NC2016) produce unlikely results. In contrast, a map produced by a bipartisan panel of retired judges (Judges) produces typical results. However, this simple analysis does not tell a complete story: In particular, as shown in the discussion of Firewalls, a map can produce quite typical results for some elections and outlier results for other elections. One of the principle visualizations we have used to explore and and communicate our results is the Marginal Box-plot. Marginal box plots were one of the principle graphics presented in Redistricting: Drawing the line , Evaluating Partisan Gerrymandering in Wisconsin, and the group’s testimony in Common Cause v. Rucho. The box-plots give a way to visually spot anomalous properties in a given redistricting plan by summarizing the structure of a typical plan, drawn without overt partisan considerations. For example, they can help identify what districts have been packed or cracked, showing which districts have many more or many less votes for a certain party than expected. The marginal box-plot give a baseline with which a given map should be compared. Two prototypical examples of marginal box-plots are giving below. They summarize what we would expect from redistricting of North Carolina in to 13 Congressional districts and viewed through the lens of the actual votes cast in the 2012 and 2016 congressional elections. Box-plot summary of districts ordered from most Republican to most Democratic, for the congressional voting data from 2012 (left) and 2016 (right). Democracy is typically equated with expressing the will of the people through government. In a Republic, the people elect representatives who then act on their behalf and derive their political mandate from having won the election. Possible corruption of the electoral results is often framed in terms of voter suppression, voter fraud, or the undo sway of money on people’s votes. Once the votes are collected, once the access to information and the ballot box is unfettered, all that remains to register the will of the people is to count each vote once and only once. 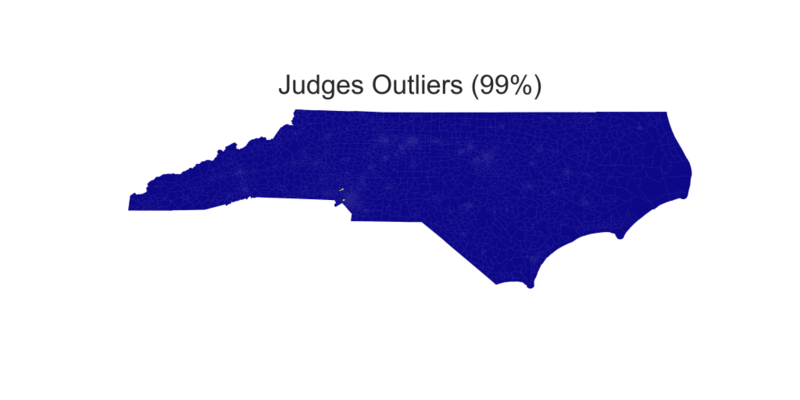 It is tempting to assume that gerrymadnering requires the presence of oddly shaped districts. After all, the term gerrymandering derives from the salamander-shaped maps produced by Massachusetts’s 1812 Governor Elbridge Gerry, and pictures of that meandering district are practically required in any discussion of gerrymandering. A Firewall is a buffer used to block unauthorized access. We adapt the term ‘Firewall,’ in the context of gerrymandering, to describe a districting plan that artificially protects the power of a political party. What follows is an exposition on how we discovered a Firewall in the enacted districting plan for the Wisconsin General Assembly that protects the Republican Party from losing the majority of the seats. For districting plans of the Wisconsin General Assembly, we generate thousands of compliant redistricting plans. To evaluate the enacted districting plan (the Act 43 plan), we ask if how many officials are elected by each party for each plan for a given a set of votes: Each plan in the ensemble will generate a certain number of Democrats and a complementary number of Republicans (ignoring independent candidates), and we can construct a histogram that measures the number of representatives from each party, out of the 99 available seats. For example, when looking at the Wisconsin General Assembly districts, we construct histograms of the projected number of Republican elected officials that would have won based on 2012, 2014, and 2016 voting data. 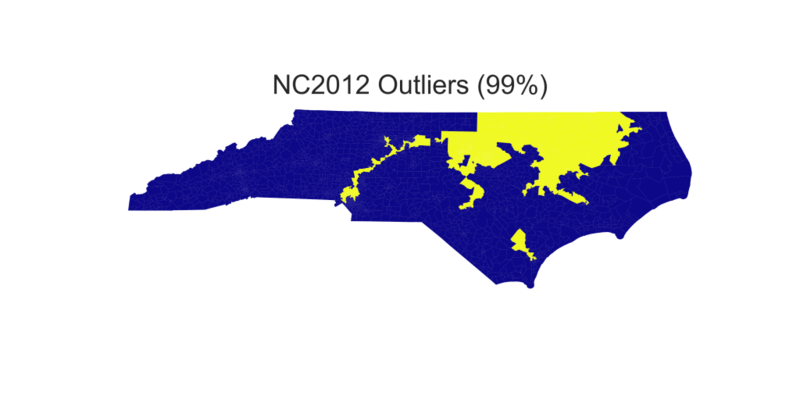 Quantifying Gerrymandering is powered by WordPress at Duke WordPress Sites. Please read the Duke Wordpress Policies. Contact the Duke WordPress team.